Jim Thorpe (born February 1, 1949) is an American professional golfer, currently playing on the Champion’s Tour. Mr. Thorpe was born in Roxboro, North Carolina, the ninth of the twelve children of a golf fairway superintendent. 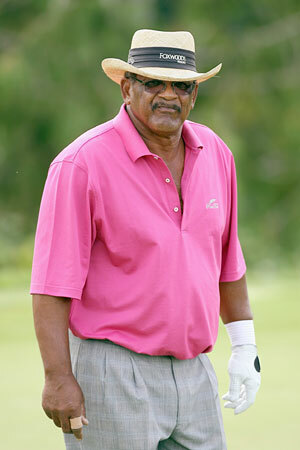 He attended Morgan State University before and turned “golf pro” in 1972. Jim Thorpe won three times on the PGA Tour in the mid-1980s and he later surpassed that accomplishment at senior level — by winning over ten times. This triumph included one senior major championship : the 2002 Tradition and making the Top 10 of the Champions Tour’s Career Money List in 2004. As the 2013 Champions Tour season starts, we are all really looking for Jim to do some great things!!! 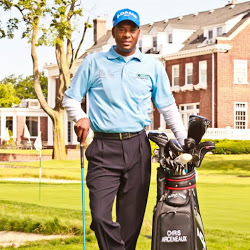 The Darby Foundation was honored to be embraced with Jim’s presence and participation at our 1st Annual Moments of History Tour, at Medgar Evers College and the Community Golf Clinic at Marine Park Golf Course, both in Brooklyn New York, September 7-9, 2012. I had the distinct privilege of accompanying him at “Garden City, Cherry Valley and Pelham Bay Country Clubs” and dinner at Spices Negril Restaurant. I was also elated that Jim would also fellowship with our church family at the Zion Cathedral Church of God In Christ under the pastorate of Bishop Frank O. and Bishop Frank A. White in Freeport, NY. As the music began to play, Bishop acknowledged our presence and extended the microphone to Jim Thorpe for remarks. Jim touched our hearts with his words of wisdom and amazing life story. I also had the opportunity to share a few of my life experiences with my fellow brethren and that day will be etched in our mind forever. Seeing Jim reunite with Jim Suttor, Head Pro at Spring Rock Golf Course and Don Beatty of Gardner City Country Club was another rewarding experience. They shared stories of their humble beginnings of competing on Tour for the Top money and making the Cut for the Card. While traveling to the Airport, Jim shared a story with me that shook me on the inside. I know my walk and journey is a “PATH TO SUCCESS”! You will hear more of these great testimonies during our “Path to Success” with our up-and-coming interviews and Tours. Next Poem for Jay-Z: Jigga get bigger with what you’re doing!